In the mid-1980s, the government introduced new legislative and regulatory reforms. Chief among the reforms was the passage of the Ghana National Petroleum Corporation Act, 1983 (PNDCL 64), which established the Ghana National Petroleum Corporation (GNPC) as the national oil company to champion state activities in the upstream oil and gas sectors. In addition, the now repealed Petroleum (Exploration and Production) Law, 1984 (PNDCL 84) and the Petroleum Income Tax Law 1987 (PNDCL 188) were passed to regulate operations and taxation in the upstream oil and gas sector. The Fourth Republican Constitution, which came into force in 1992, provides that 'every mineral in its natural state in, under or upon any land in Ghana, rivers, water course throughout Ghana, the exclusive economic zone, any area covered by the territorial sea or continental shelf in the Republic of Ghana is the property of the Republic of Ghana and is vested in the President on behalf of, and in trust for the people of Ghana.' For the effective control and management of exploitation of these resources, the Constitution requires parliamentary approval for all transactions involving the grant of a right for the exploitation and production of minerals in Ghana and further mandated the establishment of natural resources commissions to be responsible for the regulation and management of the utilisation of the natural resources and the coordination of the relevant policies. the Oil and Gas Insurance Placement for the Upstream Sector. The establishment of the state oil and gas corporation, the GNPC and the passage of the above legislation have laid the foundation and provided the framework for activities in the industry. Efforts by the GNPC has led to an increase in activities in the sector to find more oil. This has resulted in the execution of a number of agreements between the GNPC, the government and international oil companies (IOCs) to fund, acquire, process and interpret data on seismic activities from the offshore basins. In addition, the country has adopted a model petroleum agreement based on international best practice to attract IOCs.7 The IOCs that have been attracted to the upstream oil and gas sector include Kosmos Energy, Hess Corporation, Tullow UK, Norsk Hydro Oil, Heliconia Energy Resources, Anadarko, ENI, Aker Energy and ExxonMobil. These investments have resulted in deepwater offshore exploration activities. The success of the Jubilee Field has immensely reduced the risk involved in the exploitation of additional opportunities in the Basin, and has led to over 24 other discoveries offshore the Western Basin. The key discoveries include Tweneboa-1 (2009), Tweneboa-2 (2010), Enyenra (formally Owo) (2010), Ntomme (2012) and Wawa (2012) in the Deepwater Tano block; Mahogany Deep (2009), Teak-1, Teak-2 (2011) and Akasa (2011) in the West Cape Three Points block; Sankofa-1 (2009) Gye Nyame-1 (2011), and Sankofa East (2012) in the Offshore Cape Three Points; Paradise-1 (2011), Hickory North-1 (2012), Pecan (2012), Almond-1 (2012), Beech-1 (2012), Cob-1 (2013) and PN-1 (2013) in the Deepwater Tano Cape Three Points block. In May 2013, the plan for the development of the Tweneboa Dzata-1 (2010), Enyenra and Ntomme (TEN) fields, which cover an area of more than 800 km², was approved by the government. Production has commenced from the TEN fields, and the first oil was delivered to the FPSO John Atta Mills in August 2016. From 2013 to date, at least 12 exploration licences have been issued to other players in the industry, including Heritage Oil, AGM Petroleum, Britannia-U, Sahara Energy Fields, Camac Energy and Springfield. New discoveries that have been appraised include Wawa (Tullow), Mahogany Deep, Teak and Akasa (Kosmos Energy) Paradise, Hickory North, Almond, Beech, Cob, Pecan and PN-1(Hess Corporation/Aker Energy). Another investment activity worth mentioning relates to the activities in the gas sector. In 2011, the Ghana Gas Company Limited (GGCL) was established by the government as a private limited liability company with responsibility for building, owning and operating infrastructure required for the gathering, processing, transporting and marketing of natural gas resources in the country. The government has now transferred its shares in GGCL to the GNPC. Therefore, GNPC is currently the sole shareholder of GGCL and national aggregator of gas. It is estimated that Ghana has approximately 22.65 billion cubic metres of proved reserves of natural gas in its oil fields.13 To ensure the safe and optimal use of natural gas, associated gas and natural gas liquids (NGL) from the oil fields, GGCL entered into an engineering procurement construction and commissioning agreement with SINOPEC in 2012 for the development of the Western Corridor Gas Infrastructure Development Project. The first phase of the project was commissioned in September 2015 and consists of an offshore pipeline, an onshore pipeline, a gas processing plant and a NGLs export system at Atuabo in the Western Region of Ghana. At full capacity, the facility is expected to produce 107 million standard cubic feet of lean gas, 500 tonnes of LPG, 80 tonnes of pentane and 45 tonnes of condensates daily.14 The project is currently connected to the gas infrastructure to the West Africa Gas Pipeline to enable the reverse flow of gas between the two lines. Owing to increased activities in the upstream oil and gas sector after the commercial discoveries in the deepwaters, various regulatory reforms were initiated. This has resulted in the enactment of the Petroleum Commission Act 2011 (Act 821), the E&P Act and the Petroleum (Local Content and Local Participation) Regulations 2013 (LI 2204) among others. There is also the Petroleum Revenue Management Act 2011 (Act 815) that governs the use of petroleum revenue accruing to the state from petroleum exploration. The main legislation relating to the upstream oil and gas sector is as follows. The first major activity to set the stage for regulatory reform of the upstream sector was the establishment of the GNPC under PNDCL 64. The GNPC is established as the national oil corporation charged with the responsibility to explore, develop, produce and dispose of hydrocarbons. The law also mandated GNPC to advise government on oil and gas matters and to promote the exploration and orderly development of the petroleum resources of Ghana. In effect, the GNPC was created as a regulator and operator performing both regulatory and commercial functions under the supervision of the Ministry of Energy. At the earlier stages, the GNPC led the effort to acquire data to establish Ghana's reserves potential, and also led efforts to market the potential to IOCs interested in investing in the upstream sector in Ghana. However, its dual capacity created conflict that was addressed in later regulatory reform; with the passage of the Petroleum Commission Act, 2011 (Act 821), which transfers the GNPC's regulatory functions to the Petroleum Commission. Currently the GNPC is a commercial operator and the holder of government interests in petroleum operations in Ghana. It is also the national aggregator of natural gas from upstream operators to service the local market. Under the Petroleum Revenue Management Act, a specific percentage of the net cash flow from the carried and participating interests of the state is ceded to the GNPC to fund its operations. The E&P Act is the main legislation that regulates the grant of licence for upstream oil and gas activities, and regulates the exploration, development and production of petroleum in Ghana. The Act, in line with the Constitution, provides that petroleum existing in its natural state within Ghana is the property of Ghana and is vested in the President on behalf of the people of Ghana. The Act also permits the Minister to grant rights and enter into agreements for the exploration and production of oil and gas subject to the ratification of such rights or agreements by Parliament. The Act further mandates the Minister and the GNPC to develop regulations on safe construction, health and safety, product standard, reference maps for oil blocks, competitive bidding and terms and conditions of petroleum agreements. Except in the case of the GNPC, any person who intends to engage in the exploration, development and production of petroleum can only do so in accordance with a petroleum agreement entered into between that person and the government of Ghana and the GNPC. Under the Act, a petroleum agreement can only be entered into after an open, transparent and competitive public tender process. However, the Minister may, on stated grounds, enter into a petroleum agreement without going through a tender process. The Act mandates the Minister to prepare a reference map showing areas of potential petroleum fields within Ghana divided into numbered areas (blocks). Subject to rights granted to other entities under petroleum agreements entered into, the GNPC has the right to undertake exploration, development and production of petroleum over the blocks declared by the Minister as open for petroleum operations. Prior to exploration activities, the GNPC or the contractor must submit to the Minister for approval, a development plan in respect of a petroleum field to be developed directly by the GNPC or the contractor, as the case may be. payment of a bonus to Ghana. the GNPC has the pre-emptive right to acquire interest of contractors. As part of the regulatory reform following the commercial discovery of oil and gas, the Petroleum Commission was established under the Petroleum Commission Act as the upstream petroleum regulator with the object to 'regulate and manage the utilisation of petroleum resources and to coordinate the policies in relation to them'. Essentially, the Act establishes the Petroleum Commission to perform the regulatory functions previously performed by the GNPC under the PNDCL 84. Pursuant to Act 821, the Petroleum (Local Content and Local Participation) Regulations were passed in July 2013 to, among other things, 'promote the use of local expertise, goods and services, businesses and financing in the petroleum industry value chain and their retention in the country'. The Regulations focus on ensuring the maximum participation of indigenous Ghanaians, increasing local capacity and also safeguarding the interest of foreign participants in the oil and gas sector. The Regulations apply to contractors, subcontractors, service providers, licensees and allied entities in the petroleum sector. The Regulations provide minimum thresholds for indigenous equity participation in petroleum activities. A key provision under the Regulations is the requirement of 5 per cent indigenous participation in petroleum agreements. This is, however, subject to negotiation and the approval of the Minister. Service providers in the sector must have a minimum of 10 per cent Ghanaian ownership. Other provisions include the requirement for the development and approval of local content plans, which must at the minimum include sub-plans on employment and training, research and development, technology transfer, legal and financial services. In respect of legal services, operators are required to use the services of only Ghanaian lawyers or law firms for legal services required in Ghana. The oil companies are required to submit regular reports on their levels of compliance to the local content committee, which is set up to oversee the implementation of the regulations and to ensure measurable and continuous growth in local content in the petroleum sector. LI 2359 came into force in June 2018. The Regulations provide for the procedures and conditions for the grant of a petroleum agreement including qualification requirements, terms and conditions for open and competitive tendering procedures and direct negotiations. The Regulations mandate the Minister acting in collaboration with the Commission as well as other relevant agencies to prepare a strategic assessment plan for the opening up of areas for petroleum activities. It also indicates that the initial participating interest in relation to exploration and development shall be a carried interest, and in the case of production operations, an additional participation interest. Other relevant provisions include the procedure for licensing and the criteria for grant of licences, change of ownership and operating standards under a petroleum agreement. The Regulations apply to the reporting and management of petroleum data obtained from the conduct of petroleum activities within Ghana. This includes the receipt, interpretation and analysis of petroleum data, provision of a safe environment for storage of petroleum data submitted, efficient management of the data and the documentation and reporting for information related to acquisition and submission of petroleum data. The purpose of these Regulations is to specify the format, content and standards required for the preparation and submission of geological, geophysical and production data related to petroleum activities to support efficient exploration of petroleum resources in Ghana. LI 2258 applies to all petroleum operations. Among others, it aims to prevent the adverse effects of petroleum activities on health, safety and the environment and promotes high standards of health and safety. It provides the minimum health and safety requirements applicable to contractors, subcontractors and other players within the industry. The key regulations relate to design and operation of facilities, systems and equipment, maritime facilities, load-bearing structures, drilling and well systems, emissions and discharges, decommissioning, risk analysis and emergency preparedness and reporting. This Act was also enacted after the Jubilee Fields discovery to provide a regime for the collection, allocation and management of petroleum revenue in a transparent, accountable and sustainable manner for the benefit of the citizens of Ghana. The Act establishes a number of funds – the Petroleum Holding Fund, the Ghana Stabilisation Fund and the Ghana Heritage Fund – and indicates how revenues accruing from petroleum operations to the state are to be disbursed and utilised. All the funds created under the Act are public funds and may not be encumbered, used to provide credit or collateral for the state or private entities. The Act also prohibits borrowing against petroleum reserves. The Petroleum Revenue (Amendment) Act, 2015 (Act 839) was enacted to amend the Petroleum Revenue Management Act 2011. The amendment provides for the allocation of funds to the Ghana Infrastructure Investment Fund for the purposes of infrastructure development, the establishment of the Investment Advisory Committee and other related matters. 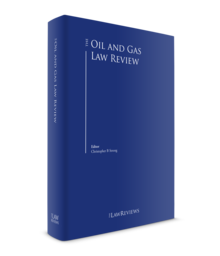 LI 2246 came into force in November 2016 for the main purpose of ensuring that an accurate measurement and allocation of petroleum forms the basis for the determination of revenue that accrue to the parties to a petroleum agreement. It applies to the planning, design, testing, calibration, operation and maintenance of metering systems as well as equipment and methods for measuring the quantities of oil and gas produced, transported and sold. The Petroleum Commission is mandated under this regulation to supervise and inspect metering and allocation systems from the design to operation stage. These Regulations also permit an authorised agency to place a seal on export valves downstream of a metering station to prevent offloading of petroleum without authorisation. These Regulations provide the framework for determining the applicable fees to be paid by participants in petroleum activities to the Petroleum Commission for various activities including permitting, third-party access over a facility that is owned by a contractor, registration of assignment of interest or transfer of shares, and registration of encumbrances over participating interest in petroleum agreements. Other costs include expenses and costs incurred by the Petroleum Commission in conducting its regulatory and supervisory services as well as fees for extension of exploration working periods and appraisal periods. The 1992 Constitution vests all petroleum resources in the president of Ghana as the head of the executive branch of government. The presidency expresses its ownership and control over oil and gas activities through the Ministry of Energy. The mandate of the Ministry of Energy includes the formulation, implementation and monitoring of national policies for the sector. The Ministry is the driver of government policy and has the overall responsibility to provide policy direction on oil and gas matters based on advice from the Petroleum Commission. The Ministry receives applications from prospective contractors, negotiates terms of petroleum agreements and grants the right to explore, develop and produce oil and gas products. It is also responsible for granting consent for the transfer of petroleum rights and resolving disputes between the Petroleum Commission and contractors (prior to resorting to other dispute resolution options). The 1992 Constitution requires all petroleum agreements to be ratified by Parliament. Parliament may also exempt particular transactions or agreements from ratification. Such exemptions must be supported by the resolution of at least 75 per cent of the members of Parliament. receiving applications and issuing permits for specific petroleum activities. Ghana became a signatory to the Convention on the Recognition and Enforcement of Foreign Arbitral Awards (New York Convention) on 9 April 1968. It is also a signatory to the Convention on the Settlement of Investment Disputes between States and Nationals of Other States, which was ratified on 13 July 1966 and entered into force on 14 October 1966. Under the Alternative Dispute Resolution Act 2010 (Act 798), a foreign arbitral award is enforceable by the court if it is satisfied, inter alia, that the award was made under the New York Convention or other international convention ratified by Parliament. In addition, the enforcement of foreign judgments in Ghana is based on the doctrine of reciprocity. On this basis, final judgments from Brazil, France, Israel, Italy, Japan, Lebanon, Senegal, Spain, the United Arab Emirates and the United Kingdom are enforceable in Ghana. For countries that do not have reciprocity, a fresh action must be instituted on the basis of the foreign judgement. Further, Ghana has signed bilateral investment treaties (BITs) with over 25 countries; however, only eight of these BITs have been ratified. Countries with which Ghana has ratified BITs are China, Denmark, Germany, Malaysia, the Netherlands, Serbia, Switzerland and the United Kingdom. In respect of taxation, Ghana has signed and ratified double taxation agreements with the Netherlands, Mauritius, Czech Republic, Switzerland, Belgium, Denmark, France, Germany, Italy, South Africa and the United Kingdom. Under its former regulatory mandate, the GNPC conducted comprehensive studies and evaluations of the overall oil and gas potential of the sedimentary basins of Ghana. Based on these evaluations, the Ministry of Energy has packaged the potential into oil blocks over which rights may be granted to prospective contractors for exploration and production under a petroleum agreement. Any person intending to engage in petroleum exploration and development must commence the process by submitting an application to the Minister. Although Act 919 favours the award of petroleum rights through competitive bidding, this option is yet to be implemented by the Ministry. In April 2018, the government launched the processes leading to the first ever oil and gas licensing round, which is expected to be concluded by early 2019 with negotiations and award of licences. This announcement was followed with the inauguration of the Licensing Bid Rounds and Negotiation committee to supervise the open tender processes. To date, however, all petroleum rights granted in Ghana have been through direct negotiation with prospective contractors. Applications are referred to the Petroleum Commission for evaluation and due diligence on the applicant. Applicants are evaluated on their financial capability, technical track record, proposed work programme and budget, and proposed fiscal package. The due diligence will inquire into the corporate status of the applicant, the competence of the management and technical team of the applicant and overall, its capacity to conduct the petroleum operations. On the basis of this evaluation, a recommendation is submitted to the Minister. If an applicant is qualified, the Minister will constitute a petroleum agreement negotiation team comprising senior officials from the Ministry of Energy, the GNPC, the Attorney-General's Department and the Ghana Revenue Authority. At the close of negotiations the draft petroleum agreement is submitted to Cabinet for approval and then to Parliament for ratification. A petroleum agreement is effective and enforceable only when parliamentary ratification is secured. dispute resolution (mandatory 30-day period for consultation and negotiation, arbitration under the Arbitration Institute of the Stockholm Chamber of Commerce, Stockholm, Sweden). material breach of the contractor's obligations. The total production of oil and gas is shared among the parties in accordance with the petroleum agreement under which the operations are made. Once the compulsory provisions of the E&P Act on the various payments to be made and interest due to the GNPC have been met, there are no restrictions on the distribution of production. A contractor is entitled to export all its crude oil entitlements under a petroleum agreement. However, where there is an emergency affecting the local supply of crude oil, a contractor may be required by the Minister to sell all or part of its entitlement to the government. This provision has been translated into the MPA, which imposes an obligation on the contractor to support the domestic supply to ensure that crude oil available to the GNPC and the government is sufficient to meet the domestic requirements. Crude oil supplied to meet this requirement shall be priced at the weighted average of the world market prices of comparable crude oils sold at arm's-length transactions for the month of delivery and adjusted for quality, location, etc., and expressed in US dollars. Under the MPA, the price of crude oil delivered is determined by whether or not it is sold or otherwise disposed of in an arm's-length transaction. Where the transaction is conducted at arm's length, the price shall be the amount actually realised by the contractor. Otherwise, the price shall be determined by reference to world market prices of comparable crude oil sold in arm's-length transactions for export in the major world petroleum markets, and adjusted for oil quality, location and conditions of pricing, delivery and payment. The E&P Act prohibits the direct or indirect transfer of interests in petroleum agreements (in whole or in part) to third parties without the prior written consent of the Minister. This restriction applies to both contractors and subcontractors. The Act also prohibits the transfer of 5 per cent or more of the shares in a contractor or subcontractor's company to a third party without the consent of the Minister. This provision is further reflected in the MPA, which goes further to add that consent shall not be unreasonably withheld or delayed and may be given subject to conditions deemed appropriate by the Minister or the Petroleum Commission. At all times, thee GNPC has the first right of refusal where a contractor intends to dispose of its interest in a petroleum agreement. Taxation of activities in the upstream oil and gas sector is regulated under the Petroleum Income Tax Act 1987 (PNDCL 188), and the Income Tax Act, 2015 (Act 896) as amended. Income tax is assessed at 35 per cent of the chargeable income or as provided in the taxpayer's petroleum agreement. The prevailing rate in recent petroleum agreements is 35 per cent. Income tax is calculated net of all expenses that are incurred in the petroleum operations. The allowable deductions include rental fees, royalties, interest on fees and loans, expense on maintenance, repair or alteration of machinery, debts directly incurred in the conduct of petroleum operations, contributions to pension or provident funds approved by the Petroleum Commission, capital allowance (determined by the law) and losses from the previous year of assessment. Expenses that are not allowed are stated under the Act. Employees of petroleum operators are subject to income tax at varying rates depending on their nationality and income. Petroleum agreements may provide some exemptions for foreign employees working in Ghana for periods under 30 days. Other taxes that are typically exempted under petroleum agreements are value added tax (VAT), customs and import duties and taxes associated with importation of equipment for petroleum operations. The E&P Act and the MPA require strict compliance with the Environmental Protection Agency Act 1994 (Act 490), the Environmental Assessment Regulation 1999 (LI 1652) and best environmental practices in the international oil and gas industry. This Act grants the EPA the mandate to formulate policy on the environment, prescribe standards and guidelines and issue environmental permits and pollution abatement notices. The Act also empowers the EPA to request an environmental impact assessment (EIA) prior to the grant of permits for any activity that may adversely affect the environment, which includes exploration, development and production of oil and gas. In addition to the LI 1652, the EPA has issued several guidelines to regulate the EIA process. The key guidelines relating to oil and gas activities are the EPA Guidelines for Environmental Assessment and Management in the Offshore Oil and Gas Development (2010), the Dispersant Importation and Use Guidelines and the Oil Waste Management Guidelines and the Dispersant Policy. These guidelines require preliminary environmental assessments for small to medium-impact scale undertakings and EIAs for field development and production activities. The E&P Act, requires the GNPC and contractors to restore affected areas and to remove items with the potential to damage the environment at the end of the petroleum operation. The activities required to be undertaken include plugging abandoned wells. Contractors are required to submit detailed decommissioning plans as part of a development plan for approval. Under the petroleum agreements, the obligation for decommissioning is placed on the contractor who must submit annual reports to the EPA for reviews and monitoring. Contractors are also required to create a decommissioning fund as prescribed in the development plans to finance the decommissioning process during the life of the oil field. The Ghana Maritime Authority (GMA) was established under the Ghana Maritime Authority Act, 2002 (630). It is the core government agency charged with the responsibility of monitoring, regulating and coordinating activities in Ghanaian waters and in the maritime industry. The GMA is responsible for ensuring a safe and secure marine environment and in charge of monitoring economic activities in Ghanaian waters including oil and gas activities. To ensure the safety and protection of vessels, infrastructure and other assets within Ghana's maritime jurisdiction, the GMA is mandated under the Ghana Shipping (Protection of Offshore Operations and Assets) Regulations, 2012 to issue permits for operation, location and movement of mobile offshore drilling equipment. Other activities the GMA permit are the operation of vessels, siting of installations and storage facilities and the laying of pipes, cables, equipment and all structures and devices on the seabed or in an area within Ghana's maritime jurisdiction. The GMA is also the implementing agency of Ghana's obligations as a member of the International Maritime Organization (IMO). Accordingly, it is responsible for ensuring compliance with the design, construction and equipment requirements of the Code for the Construction and Equipment of Mobile Offshore Drilling Units, 1979 (IMO Resolution A.414 (XI) as amended by MSC/Circ. 561); (the 1979 Mobile Offshore Drilling Unit Code) and has in force a Mobile Offshore Drilling Unit Certificate (1979); or the Code for the Construction and Equipment of Mobile Offshore Drilling Units, 1989 (IMO Resolution A.649 (16) as amended by MSC/Circ. 561 and Resolution MSC.38 (63); (the 1989 Mobile Offshore Drilling Unit Code) and has in force a mobile offshore drilling unit certificate (1989). Under the E&P Act, a contractor in a petroleum agreement is required to be incorporated in Ghana. Therefore, a foreign investor must incorporate a local entity in Ghana to enter into a petroleum agreement. The entity is also required to open a bank account and maintain an office in Ghana with a representative who has the authority to bind the contractor. A branch of a foreign entity cannot be a party to a petroleum agreement. Subject to providing all the relevant documentation, a local entity may be incorporated within 10 working days. The entities with foreign ownership are required to register with the Ghana Investment Promotion Centre prior to commencement of operations. LI 2204 places an obligation on contractors to hire more Ghanaians over time and develop plans for attaining almost 100 per cent indigenous employment within 10 years of petroleum operations. The employment of staff (Ghanaians and expatriates) in the oil and gas sector is also regulated under the Labour Act and the Pensions Act. Since assuming its regulatory role in 2011, the Petroleum Commission prioritised the need to improve the public perception about the upstream sector by increasing consultation and transparency in the sector. In its regulatory role, the Commission monitors compliance with national law on anti-corruption and bribery. Foreign entities are also monitored by other public agencies for compliance with foreign anti-corruption legislation that have extraterritorial effect such as the Foreign Corrupt Practices Act of the US and Bribery Act of the UK. Currently, a key concern in respect of transparency is the process of the award of petroleum rights. To resolve this, the government this year has made a commitment to launch a public tender of at least three new oil blocks in accordance with requirements under the E&P Act. The law further provides for the establishment of a public register of all petroleum agreements; however, a register is yet to be set up for this purpose. Also, the variation of terms in the various petroleum agreements have raised concerns relating to fairness and transparency. The introduction of an anti-corruption warranty clause in recently negotiated petroleum agreements is expected to pave the way for even further reforms in transparency in the grant of petroleum rights. The clause requires contracting parties to certify compliance with the anti-corruption laws of Ghana, their countries of incorporation as well as the Convention on Combating Bribery of Foreign Public Officials in International Business Transactions, the United States of America Foreign Corrupt Practices Act 1977 and the United Kingdom Bribery Act 2010. On 1 June 2018, Aker Energy announced the acquisition by its subsidiary Aker Energy Ghana AS, of Hess Ghana, the operator of the Deepwater Tano Cape Three Points block (DWT/CTP), which holds an estimated 550 million barrels of oil and has the potential for a further 400 million barrels. Following the acquisition, Aker Energy is currently the operator of the DWT/CTP block and the holder of a 50 per cent interest with the other partners Lukoil (38 per cent), Fuel Trade (2 per cent) and GNPC (10 per cent). Aker Energy has also announced that the licence partners intend to submit a plan of development in the first half of 2019 with anticipated first oil in fourth quarter of 2021. In January 2018, the government signed a petroleum agreement with ExxonMobil in respect of the Deepwater Cape Three Points block. ExxonMobil holds an 80 per cent interest in the licence and will act as operator of the block. The other licence partners are GNPC (15 per cent). 5 per cent interest is expected to be granted to a Ghanaian company to be identified by ExxonMobil and the government. The Ministry has recently announced plans to award licences for nine new oil blocks in the Western Basin. Six of the blocks are planned to be awarded this year, while the remaining three shall be awarded in 2019. Of the six blocks slated for 2018, three are planned to be allocated through open public competitive tender, two through direct negotiations and one shall be reserved for GNPC to explore in partnership with its chosen strategic partner. On 4 July 2018,18 ENI, the operator of the OCTP Integrated Oil and Gas Development Project announced the start of gas production from two of the four deep-water subsea wells connected to the FPSO John Agyekum Kufuor in the Sankofa field. OCTP, is planned to deliver 180 million standard cubic feet per day for at least 15 years. Natural gas production will flow through a dedicated 60km pipeline to an onshore receiving facility in Sanzule. Following the award of the licence for the Onshore/Offshore Keta Delta Block to GNPC, Swiss African oil Company and PET Volta Investments in 2016, the operator of the block, Swiss African Oil Company (a subsidiary of Swiss African Petroleum Ag) has commenced a public hearing as part of the processes for an environmental impact assessment for the project. The public consultations are expected to help elicit concerns and expectations from communities about a proposed 2D seismic survey by operator in the Keta Delta Block. The Keta Basin covers an area of approximately 33,900km² of which 1,900km² is onshore. 1 Ferdinand Adadzi is a partner and Nana Serwah Godson-Amamoo is an associate partner at AB & David. 2 National Energy Policy (February 2010), Ministry of Energy. 5 National Energy Policy (February 2010), Ministry of Energy. 8 Ghana Gazette, No. 5, 2014. 15 Income Tax (Amendment) Act, 2016 (Act 907). 16 The Petroleum Revenue (Amendment) Act 2015 (Act 839). 17 Formerly Ministry of Petroleum.